It has the yummiest Korean barbecue instead! Think we’re obsessed with Korean men? Wait till you hear what we have to say about Korean food! 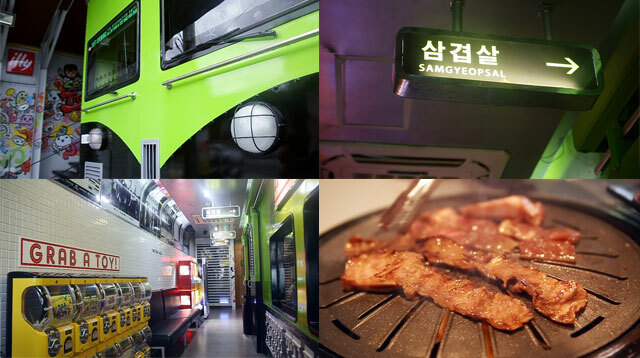 Recently opened Seoul Train in Quezon City is where you should be headed with your barkada this weekend! This restaurant’s passion for fresh meat is evident through its Saeng Galbi, Yangnyeom Galbi, and Ggot Deung Sim! They’re on a whole other playing field. "Why a train," you ask? The couple behind Seoul Train had their first date on a train, is obsessed with trains, and travels by train as much as possible! That said, prepare to be visually and audibly transported as soon as you walk in. All aboard? Visit Seoul Train's Facebook page for more info. Editor's Note: This article originally stated that one of Seoul Train's featured dishes is Samgyeopsal. To clarify, Seoul Train's specialty is beef, specifically the Saeng Galbi, Yangnyeom Galbi, and Ggot Deung Sim. VIDEO: VIDEO: Jean Saturnino, Kevin Rosales, Daniel Ocrisma.